A rough and tumble racer. What is it? A racer that places destruction at centre stage, from the FlatOut devs. Listen, I know how it might have looked when I dived down the inside without braking and t-boned someone called PoorLifeChoices so hard it shrank their car in half. But these things happen in racing, don’t they? Like the fire that broke out last race after the first corner. Or at that lawnmower event, when I knocked an opponent off and continually ran over his lolloping cadaver. Tragic, yes, but these things do happen. For rigorous sim racers and apex-gazing casuals alike, Wreckfest is a refreshingly different flavour of driving game. The spotlight’s on physics simulation and damage modelling above all else here, every race a spectacle of exploding tire walls, mangled bonnets and nasty screeching sounds. And while that means it exists in vaguely the same ballpark as slapstick sandbox Beam.NG, it’s structured and presented like a much more traditional sim-cade racer. So when the destructive novelty wears off—and that takes a long time, incidentally—there’s still the dangling carrot of career mode progress to keep you behind the wheel. Championships lead to more championships, in faster cars this time, and the odd special event like the aforementioned lawnmower fiasco punctuates it all. A twenty-strong garage of proudly unlicensed vehicles provides an excuse for some aesthetic and performance fiddling as you unlock better parts, but this all feels secondary to the point of optional. Wreckfest really just wants you to make a mess. Which means the racing itself is unlike anything else in the genre. The handling model gets a pass for its weightiness despite aesthetic damage having little effect on vehicle behaviour, and that only seems in-keeping with the spirit of the game. It’s the kind of game that’s more enjoyable when you’re nursing an unrecognisably mangled car around in thirteenth place in a pack of twenty than when you’re winning. The kind of game in which you don’t feel the least bit bad about nudging someone into what would surely be a fatal collision, whether the opportunity to do so arises in solo or online play. It’s brutal racing, and so nice to have an excuse to indulge in it. It isn’t just that the crashes look great when they happen, although that’s certainly part of the draw. It’s the way your brain starts to connect different neural pathways as you play, accelerating where it might once have braked, taking wildly different lines than convention would deem ideal, and cracking a smile, rather than a monitor, when your race ends in a devastating pile-up. Example: it’s turn one in an online race and there’s another racer on the inside, about halfway-level with your car. If this was Gentlemanly Racing Simulator 2018 you’d hold your line and brake at the usual point, but since it isn’t, you brake much earlier and watch your opponent overshoot the turn haplessly. You know they were counting on using your passenger side door as their brake, and you were smart about it. Later in the race you might employ that same inside line tactic on an opponent, flagrantly ramming him into an advertising board. It’s brutal racing, and so nice to have an excuse to indulge in it. And that’s just the circuit racing. Cult classic destruction events like Destruction Derby and the more recent Dirt Showdown, drop the facade of sportsmanship altogether and simply provide arenas for an intractable scrum of vehicles. In other words: everyone drives into each other until only one car is left functional. This kind of thing has fallen out of favour in recent years, not least because no one seemed able to attach much order to the chaos or discourage game-breaking strategies like the old ‘driving in a big shameful circle around the arena perimeter while everyone else fights’ staple. And that’s true here too, but still deeply enjoyable. The whole house of cards would fall down if the physics and damage modelling underpinning it all weren’t sound. As you might expect from a game that’s spent over 1500 days in Early Access, sound they are. It’s easy on the system, too, for a game with so many particles being tossed into the air, and so many crumple zones to accurately model. Max settings on a GTX 1070 will yield a stable 60 fps at resolutions exceeding 1080p, thought not quite at 4K. It’d be hard to argue that Bugbear succeeded in what they set out to achieve. The question, really, is whether that’s enough to sustain Wreckfest as a long-term prospect. 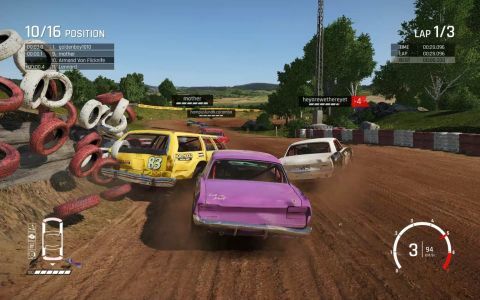 There’s some longevity in the multiplayer and its unnervingly friendly patrons, but unfortunately compared with the big dogs of the genre and their eSports leagues, Wreckfest may not have the infrastructure to keep a community in it for the long haul. It’s one for the physics sim lovers and the junkyard fighters—just don’t expect months’ worth of depth.